In this lesson let’s learn about Cairo Egypt facts. Cairo is the capital of Egypt and the largest city in Africa. In Arabic the meaning of Cairo is “the Victorious”. The city Cairo is located on both banks of the River Nile. River Nile is the longest river in the world. It is 6695 km long. Cairo is a city with over 15 million people. 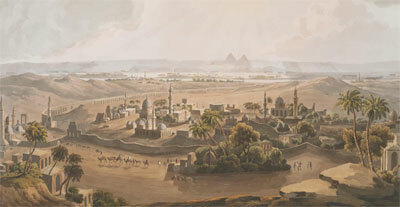 The people of Cairo are known as ‘Cairenes’. Nearly all of them are Egyptian Arabs and the main religion is Islam. Cairo is the chief commercial and industrial centre of Egypt. Local industries manufacture (produce) cotton textiles, food products, motor vehicles, aircraft, iron, steel and chemical fertilizers. Cairo contains many cultural institutions, business establishments (organisations), governmental offices, universities, and hotels. Cairo has a sunny, hot and dry climate. In the winter a little rain falls. The average maximum temperature in Cairo is 35 degrees centigrade during the day time. But it is very cold at night. Because of the city’s warm climate and numerous (many) historical and cultural attractions, tourists visit Cairo every year. Most of these tourists like to see the famous Egyptian pyramids and sphinx. Also, click here to read facts about India.